This guide reviews platforms that provide crypto trading tax services, as well as how to report cryptocurrency on taxes. Included websites provide you with an online account where you can import all your transactions and calculate your tax obligations quite fast. Since different governments have their own tax policies, we review platforms in terms of regions served and complexity of reports provided. Below you see a comparison table including some of the tax reporting software we will cover in this article. You can check out other platforms by researching social media, such as cryptocurrency taxes Reddit search. 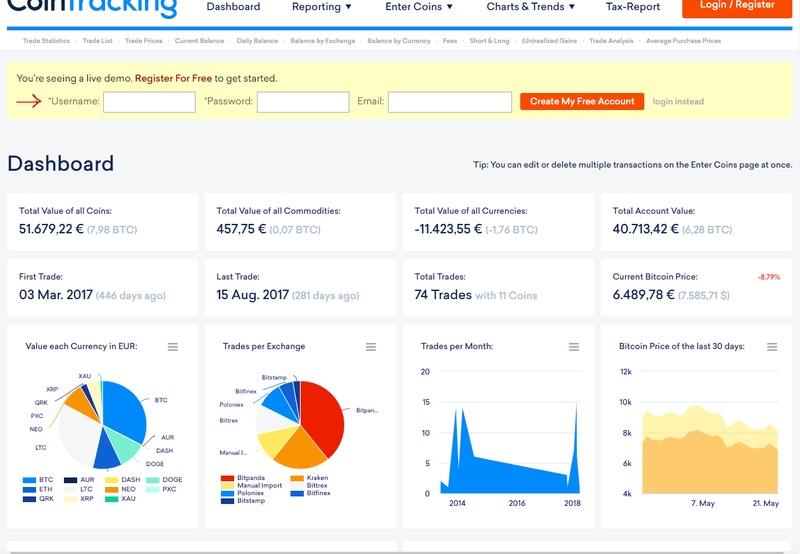 Cointracking specializes in tracking and reporting crypto tax services for crypto businesses and traders alike. It offers a wide range of products for its clients, including trade statistics, prices, reporting tools, balance calculations, and tax reports. You can choose to automatically upload trading history via an API from all common crypto trading platforms. The main gist of the website is the ability to have a complete report and even budget prepared for you. The picture below offers a snapshot of the platform, as well as how reporting works at Cointracking. Once you import our transactions into the platform, you immediately have an attractive data presentation, as seen in the picture. Statistics like the ones below provide accurate description not only of your taxes but of your business as well. Apart from standard reports, you also have charts, statistics, and graphs, as seen below. As for the crypto trading tax calculator, all positions are shown transparently, as well as the calculations made. The platform supports many different countries, including the US, Europe, and Asia. You have the option to use crypto trading tax services for free while paid plans (Ultimate and Pro) have many additional features. Free accounts don’t have tax reporting as part of their account. Cointracking has both wallet import and exchange import from almost all exchanges including Binance, Bitfinex, BitMEX and more. CFD trading platforms like eToro and Markets are not supported. 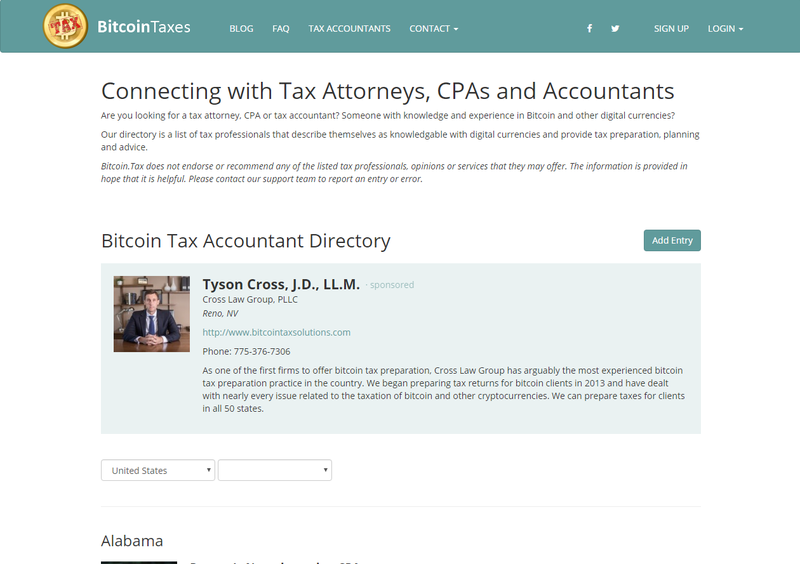 BitcoinTaxes is quite different from Cointracking, since it offers crypto tax services only. It provides help for traders originating from the US, Canada, Australia, Germany, and the United Kingdom. You have the option to import your transaction history and balance form major exchanges, such as Coinbase, Gemini, Circle, Bitstamp, BTC-e, Bitfinex, Kraken, or CSV. The same service is available for the online wallet as well, which saves time from creating a new table by yourself. The company offers tax models based on FIFO, LIFO, and average costing, which is flexible enough for most systems. The platform also has a competitive advantage over its reveals in terms of its partnerships with accountants. You have the opportunity to work with your personal tax advisor through a program called “Tax Accountants”. The snapshot below represents a page for tax attorneys, where you can contact professional that operates in a U.S. state in which you live. Since different regions might have their own policies, it is important to collaborate with the right professional. Also, the page offers information regarding their history, experience and a link to their website. The website does not require any sort of personal information from you nor are you obliged to provide scanned documents. It is thus important to note that, although it provides services, the platform itself does not prepare tax reports for you. CryptoTaxPrep has several programs available for its clients. If you engage in crypto trading operations, you should definitely consider this platform for your taxes. The company offers accounting, bookkeeping, and tax reporting services, organized in plans. There are overall four major plans to choose from, them being Starter, Base, Premiere, and Platinum packages. Each of these varies in terms of services available, with the main difference being support of investment reporting and tax reporting forms creation. CryptoTaxPrep works only with US customers and is licensed by Certified Public Accountants. You can report any sort of cryptocurrency in this platform, as rules are practically the same for all coins. You don’t need to provide any sort of scanned documents, even when purchasing plans or doing tax reports. LibraTax comes from the company called Libra Services and is a platform dedicated to crypto tax reporting and form creation. It works with several platforms in terms of your records and market trends. These platforms include Coinbase, GDAX, Bitstamp, BitGo, Blockchain.info and Bitcoin and Ethereum blockchain transactions. It uses a spreadsheet to show all records and to create the US Tax Form 8949. Its services are free, without any costs attached to it. It works with mainly the United States, Europe, and Asian countries, while values include several fiats. You don’t need to provide any personal details or scanned documents. Cryptotrader.tax is a crypto trading tax USA platform that offers FIFO (first-in-first-out) recording. However, residents from other countries can open up an account as well. What makes this website quite interesting is the fact that you can calculate your cryptocurrency taxes for free. As long as you only import and calculate within the website, it is free of charge. However, should you wish to download reports and fill out your IRS Form 8949, then the yearly $39.99 subscription applies. Unlike other companies, Cryptotrader accepts fiat payments, through Visa, MasterCard, or American Express credit card. Since the platform is new, supported exchanges include Coinbase Pro (parent website Coinbase included), Bittrex, Gemini, Binance, and Poloniex. There is also a feature of contacting individual tax advisors and accountants that could help you make crypto tax prep easy. All professionals base their operations within the U.S., meaning that financial advisors base their knowledge on the American financial system. If you are looking for a platform that works with a wide range of platforms, currencies, and digital coins, Zenledger might the place to go for. However, the platform has quite a high price schedule for its plans, compared to the competition in the industry. crypto tax services range between $99 and $299 per year, depending on the chosen program. There are overall three plans to choose from, them being Stingray, Shark, and Whale. These differ in terms of features and functions available. The website allows freedom on how to organize crypto inventory, including both FIFO and LIFO methods. The reach is global, while downloadable reports include 8949, Schedule D, FinCen114, and FBAR. In this article, we provided our readers with a few different ways to simplify your crypto trading tax. We definitely think it is worth the cost to get cryptocurrency tax software to help you calculate obligations. Some platforms have a free option to try first. The important thing is investing in some software – it saves time by doing complex calculations in your stead, which can be quite time-consuming and dull. Depending on how many trades you have per year, you can choose between the different price packages. Keep in mind that cryptocurrency tax laws change these days quite rapidly, so investigate them regularly. Understanding corporate income tax, as well as other tax categories, would help you determine your obligations for a particular year.